After finishing up my first two bear tours of the season, I am glad to report that June and early July were really good with a surprising number of bears at both Kukak and Hallo bay. I feel lucky to have been able to lead tours to locations like this with so many bears in mostly good weather with tons of action, so thanks to my trip participants for making this possible. lens @ 120mm, 1/500 sec at f/14, manual mode, ISO 500. EV, -0.7. Image Copyright 2016 Robert OToole Photography. As soon as mother bear stopped and looked up I grabbed a Sigma 18-300 C travel and stopped down to f/14 to extend the depth of field for sharp Lupines and mountains in the background. The Weather June can be a little slow after a harsh winter and spring but this year that was definitely not the case with so many bears and cubs out in force. Technically June, July, August are about equal in terms of rain but this June was a little wetter than normal this year with one tour losing a couple of days two to non-stop rain before recovering with beautiful cloudy skies and lots of great shooting. Yearlings spending their morning sparring. Katmai NP Alaska, NIKON D500 and SIGMA 120-300 mm f/2.8 Sports lens @ 300mm, 1/1250 sec at f/3.5, manual mode, ISO 320. Image Copyright 2016 Robert OToole Photography. Cloudy overcast mornings are typical for June in Katmai and as you can see in the image above not only is this kind of light not a problem with modern DSLRs but these conditions are preferred. Water droplets create lots of nice details with saturated colors and the cool temperatures mean more bear activity. Full sun on the other hand creates lots of issues with sharpness due to heat waves and dry chalky glacial mud everywhere and the heat in the middle of the day really slows the bears down. Sports lens @ 300mm, 1/800 sec at f/4, manual mode, ISO 280. Image Copyright 2016 Robert OToole Photography. The number of bears and mothers with cubs around this year was just fantastic. At Hallo we had at least five mothers with cubs, Kukak had 12 bears around one morning. For some reason spring cubs were not around early this summer but there were lots of yearlings to keep the photographers really busy. Sports lens @ 240mm, 1/1250 sec at f/4, manual mode, ISO 400. Image Copyright 2016 Robert OToole Photography. At Hallo we had the pleasure to see three mothers with adopted cubs. I have seen this before in years past but no this many at once. It was reported that there was a total of 5 mothers with adopted cubs this year a Hallo! This is always really interesting behavior to see and photograph. When this cub started running at me and I wanted to record that exact moment it would be in the air over the logs in the foreground so I locked on to the bear's head with 3D AF and carefully placed the mountains in the top of the frame and D500 and 150-600 sigma sports lens precisely tracked the bear perfectly. The D500+150-600 S is one serious image maker with the best Image quality I have seen from a crop sensor body. I even managed to make a few frames up to ISO 5500 that looked fine without any noise reduction. The Nikon D810 is still my favorite overall camera but the D500 really makes a lot of sense for wildlife photography. Now that the D500 is out the D4 or D5 pro bodies slide further down my recommended equipment list for wildlife photography. For the price of a new D5 you can pick up a D810, D500 and a new Sigma 150-600 sports lens and still have money leftover for some new memory cards. Sports lens @ 160mm, 1/1000 sec at f/4, manual mode, ISO 400. Image Copyright 2016 Robert OToole Photography. This year my bear tour schedule was split into 3 separate weeks in June, July and August and so far my experiment is really paying off. Sports lens @ 170mm, 1/500 sec at f/3.5, manual mode, ISO 900, EV -0.3. Image Copyright 2016 Robert OToole Photography. 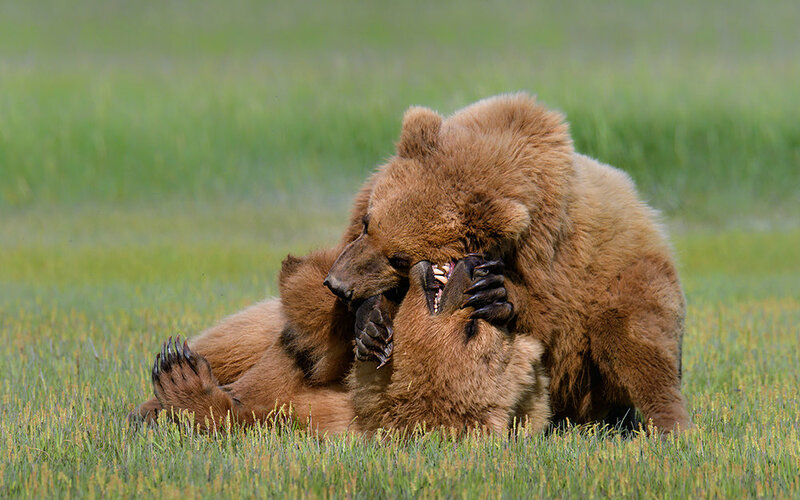 There are two islands that I know of where shy mother bears take cubs to live for extended periods. This always works out great for photography and this year was especially good on one island that ended up with two mothers with cubs! Sports lens @ 160mm, 1/1000 sec at f/3.5, manual mode, ISO 1000, EV -0.3. Image Copyright 2016 Robert OToole Photography. In Katmai biggest source of stress for a mother bear with a cub large adult male bears so an island is a solution that offers sanctuary from other bears and at the same time creates and ideal set up for photography. Sports lens @ 250mm, 1/1000 sec at f/2.8, manual mode, ISO 360. Image Copyright 2016 Robert OToole Photography.